We even have a brand new category of Hypermobility Spectrum Disorders (HSDs) to diagnose now too! Thanks for your patience while I got my site updated in time for Ehlers-Danlos syndromes Awareness Month in May 2017. And please refer to this site via the international Ehlers-Danlos Society for the ultimate answers. I urge downloading the 18 classification papers while they are available for FREE here now. They may go back behind a paywall at some point, so I would snag a copy just in case! Boy is this a hot topic! Naturally, since it’s often so hard to even get a doctor or doctors to listen to us and recognize our vast collections of symptoms as a possible systemic condition, we naturally want an easy test to take and be done with this painful journey. Our often Aspie brains and over busy doctors want this too, natch. Well, I’m sorry to break it to you, but there is no single test for ALL of the types of Ehlers-Danlos Syndromes yet. And there may never be. Not only is there not just one single type of EDS to begin with, but there is no single tissue marker or makers identified yet to test for the most common type of EDS, known as hypermobile EDS or hEDS (formerly known as Type III EDS). And there is no single test panel to identify which type of rare EDS you might have if you do suspect one of those as Dr. Murray explains in this webinar from October 2015. Also, we now refer to the collection in the plural, as noted here. 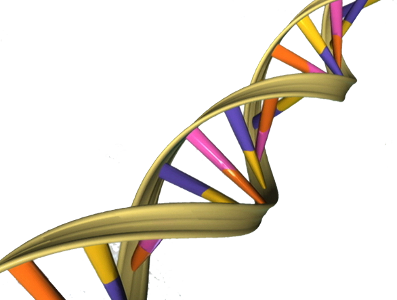 There were six main types of EDS recognized until March 14th, 2017, but myriad one-off mutations in single families around the world with new ones found periodically. There are now 13 total types recognized as of March 2017, up from the former six main types prior. 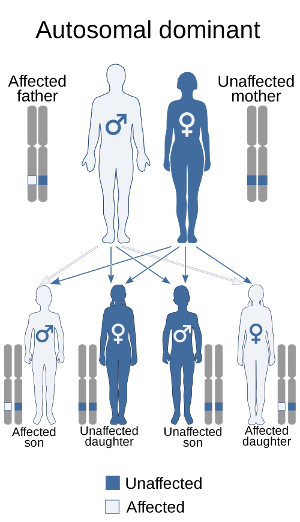 Five of those six former types were considered rare, but now all thirteen are considered rare again based on the new criteria, and twelve of the thirteen now have known genetic markers. Update May 2018: A 14th really rare autosomal recessive form was just announced in April 2018 but is not part of the official new (2017) nosology yet. This is likely to continue happening over time until the nosology is updated again in a couple of years. But the most common type by far still, hypermobile EDS or hEDS as it’s called now (no numbers any more please!) does not yet, so can only be diagnosed clinically yet using the new 2017 diagnostic criteria for it. So I will now refer to all forms of EDS as rare again, but I personally do not consider the HSDs to be, just rarely recognized still and no, not just because they’re new. Because patients’ complaints keep being dismissed as mine were for 44 years due to misinformation and misunderstanding about how common the condition is. Even if you got Whole Exome Sequencing (WES) testing or some other thorough panel or set of tests (like the TAAD panel at UW Collagen Diagnostic Lab), you still cannot rule out or in all EDS this way since not all the markers are identified yet, and may never be. Our DNA is vast and ever changing! I.e, you may have your very own collagen defect and syndrome, who knows. Or it may turn out to be something else entirely that just mimics a collagen defect. This wouldn’t be the first time. Just ask folks with Marfan or Stickler Syndromes. But no, you should not diagnose yourself via your raw data from 23andMe, contrary to rumors in many online support groups led in part by second party data interpretation service providers currently. These are likely finding nonsense mutations that aren’t known disease causing mutations, nor statistically significant mutations, aka “SNPs”, or single nucleotide polymorphisms. (Pronounced “snips” in English.) Not all SNPs cause disease or trouble just because they are on a gene of interest (e.g. ADAMST2, PLOD1 etc. ), some are just variations from the wild type, period, like hair color. You wouldn’t say brown haired people have a hair disease for instance, right? Further, few doctors will take such a diagnosis seriously, nor should they. One geneticist I know has found errors in his patient’s 23andMe data after running WES on them later. And the second-party data interpreters (e.g. LiveWello, Genetic Genie, etc.) are not known for high accuracy for another thing. LiveWello is currently allowing patients to choose their own unproven sets of SNPs and combine them into “reports” you can then run against your raw 23andMe data. According to one of these, I technically have four different rare forms of EDS – I don’t think so! Yes, you can use it to suspect something, but only to suspect and start a conversation with your doctors. NOT to diagnose! I’ve also gotten conflicting results from my own raw data after downloading and parsing it through the same parser at different times. One time said I had a particular defect, the other time said I didn’t. From the same identical unaltered zip file. Which one is correct? I may never know. But I don’t think I should medicate or diagnose based on such questionable info! To quote Dr. Ben Lynch, “treat the person, not the SNP“, always. Please do consult a qualified doctor, preferably a geneticist to get the most accurate and complete diagnosis (remember Hickam’s Dictum), while ruling out other similar Heritable Connective Tissue Diseases (HCTDs)and other similar or secondary conditions while we continue tracking down more mutations for hypermobile EDS. You might look for a local support group to help find the knowledgeable doctors in your region. Hypermobility, often mis-interpreted to mean flexibility by most people itself is just a trait, like red hair color, and in itself is generally benign. It is thought to run in about 10% or more of the general population and lends nicely to gymnastic and ballet careers. The EDS and now also the HSDs all involve hypermobility plus symptoms, or issues like fallen arches, bad teeth, tendinitis, hernias, easy bruising, varicose veins and so much more that ultimately drive you to see the doctor a lot for those who aren’t in denial. And so are some forms of the HSD too – include varying levels of hypermobility plus issues that drive you to the doctor. This is the reason the now obsolete BRIGHTON (as in Brighton, England with an “r”) Diagnostic Criteria were developed almost 20 years ago – the leading specialists realized they were missing a lot of older and less bendy patients who are either no longer flexible, or never were, but who all have common extra-articular (meaning non-joint-related) issues and signs of a collagen defect. (Stretch marks, odd scarring, thin or stretchy skin, myopia, varicose veins, tendinitis, hernias, prolapses, etc.) But they may not have obvious or predominant signs or family history of one of the more rare types of EDS leading to suspecting those. Update March 20, 2017: Alas, the Brighton Diagnostic criteria are now gone, and supplanted by these now. On a good note, we will no longer have to deal with the confusion between the Beighton 9 pt hypermobility scale or score, and the Brighton diagnostic criteria (which included the Beighton scale), which no one ever kept straight! The two most common types of EDS, hEDS and cEDS, appear to have an autosomal dominant inheritance pattern, meaning that if just one parent carries the defective gene, you have a 50% chance of passing it on to a child. Vascular EDS is also autosomal dominant, but more rare due to its lethal nature. Although this has not been verified nor confirmed for hEDS yet. Further study is warranted and eagerly sought! But other forms are autosomal recessive, so are even more rare, thankfully. Both parents would have to carry the same recessive gene for a child to express the defect also which by Punnet Square math happens only 1 in 4 times (or a 25% chance) even then. And again, this does not preclude an occasional rare “de novo” (new) mutation that might spring up in a family once in a while. Though I’ve yet to meet one who truly did not show a family history once we delved deeply enough and I enlightened them further to the MANY manifestations of EDS, but the possibility does exist, however rare. Once you’ve ruled out all the more distinct rare forms of EDS and other HCTDs as described above, you are then left to diagnose the most common type of EDS by far known as hypermobile EDS or hEDS, clinically only via a thorough physical exam using these new criteria. And if the patient is not bendy enough, or doesn’t pass those, then one of the forms of Hypermobility Spectrum Disorders should be considered now as previously mentioned. 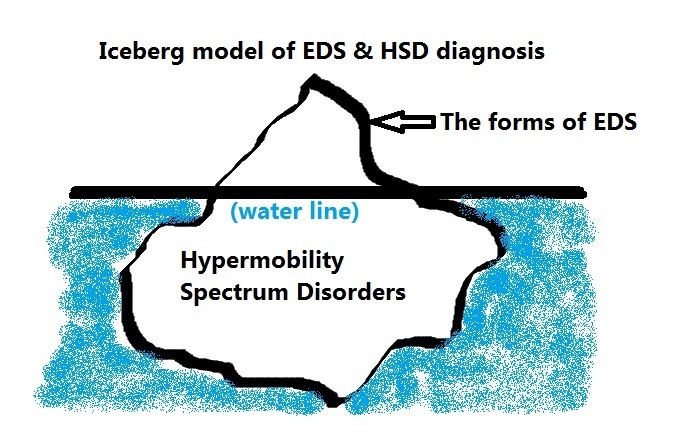 I like to think of the forms of EDS as the tip of the iceberg, easily visible above the water line and thus more easily diagnosed, and the new Hypermobility Spectrum Disorders are the vast majority that are less visible to the medical eye below the water line that we have just now recognized is there. Look below the water line! I for one think this is okay – at least we have something to hang this painful condition on, and if all of us patients will start to take it seriously, hopefully we’ll get our doctors to do so too. Because right now, I technically would not pass the hEDS criteria, as I’m too stiff, despite being uber bendy as a child. So I would match the new “H-HSD” category, or Historic Hypermobility Spectrum Disorder best, I think. hEDS has often been under and misdiagnosed as Fibromyalgia, Hypermobility Syndrome, Joint Hypermobility Syndrome, and (my fav) Benign Joint Hypermobility Syndrome in the past. All of these diagnoses and names are also going away, and one should be diagnosed with either a form of EDS, or a form of Hypermobility Spectrum Disorder now based on the above. Hopefully more rheumatologists will be made aware of this new diagnosis, to help ease the burden on the overloaded geneticists currently. That said, a geneticist’s diagnosis will carry more “weight” with other doctors, and some specialists require this before they will treat for things like Chiari Malformation (which is surprisingly common among us), though technically any doctor can diagnose an EDS or an HSD that is willing based on the above. It’s just that few are willing to stick their necks out yet, and… the information above is brand new to everyone since March 2017. Ehlers-Danlos of all types runs across all races/ethnicities. 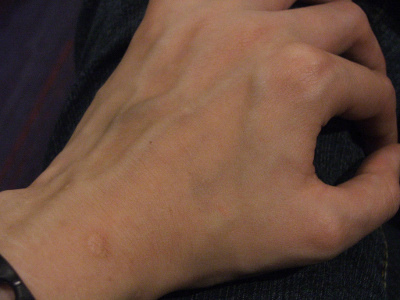 But thanks to more visible blue veins showing under their more “see-through” skin, almost everyone with light or pale skin wonders at some point if they don’t have vascular EDS (vEDS, formerly Type IV), a dangerous rare form that lends to more shortened life spans than most from arterial or inner organ rupture. “Proband” is genetic speak for “person presenting now” (I.e, the patient), vs their parents or children. I actually had vascular and kyphoscoliotic types ruled out based on a history of an ascending aortic aneurysm (or AAA) in my dad, skin and facial features, severe scoliosis in my aunt from birth, keratoconus, visible veins, and small joint involvement among other things. I was relieved to learn I was negative for both, and we settled on the as yet not fully defined hEDS for my diagnosis. Further, although EDS types generally run “true” within a family, meaning if your parent has vEDS, you will get vEDS (if you do), it is possible to have more than one type of EDS coexisting in one person, even if it’s rare. I know one patient with both a rare form of EDS AND Marfan Syndrome, both confirmed with genetic testing. Talk about winning the genetic lottery! But generally EDS will run true to type, meaning, if your contributing parent has classical EDS, you will inherit that form, and not kyphoscoliotic EDS, unless careful medical history or testing reveals another form from the other side of your family. And for what it’s worth, I’m finding most who have gotten diagnosed the most easily (i.e, are the most symptomatic/afflicted) in my large support groups online recently notice signs on BOTH sides of their families in 20/20 hindsight including myself. (Update 2018: I’ve since met a cousin on my late mother’s side who is diagnosed with hEDS also so this is now confirmed for me.) Leaving me to think a large percentage with single alleles of some form of hypermobile EDS or the new Hypermobility Spectrum Disorders may constitute what I call the “Walking Wounded” (less clinically visible as I was for 44 years), or folks who got diagnosed with “just” HMS, JHS, or BJHS or more often the catch all bin: Fibromyalgia, a common under and mis-diagnosis for us. UPDATE March 2017: HMS, JHS and BJHS have all been supplanted by both the new hEDS and HSD nosology and will no longer be diagnosed. Contact The Ehlers-Danlos Society with questions at info@ehlers-danlos.com. No, these conditions are no cake-walk, though yes, as I’m slowly but steadily proving along with many other hardy survivors that you can recover to some extent through dedicated nutritional & dietary work and tailored “zebra-friendly” (core-building) physical therapy that avoids injuring us further, and strengthening the bits we can. I am now walking a bit again thanks to five years of slow, steady hard work in a warm water therapy pool and on my bike, along with a disciplined custom low-inflammatory diet and supplementation. Lastly, I’ll note that having EDS itself, as comprehensive as it is, does NOT preclude having other diseases, conditions or issues (aka comorbidities), simultaneously. As Hickam’s Dictum states: “patients can have as many diseases as they damn well please!” And I mean beyond the incredible list of ones I’ve already noted are fairly common in the community (thyroid issues, autism spectrum disorders, depression, CVID, allergies, insomnia, chronic fatigue, fibromyalgia, etc.) 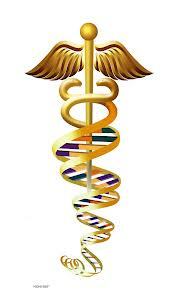 You may have any number of other illnesses and genetic disorders in addition, also. As someone else unknown to me brilliantly said, EDS is as individual as fingerprints, and we are all unique individuals in addition especially when you toss in environmental factors which influence our epi-genetics, a whole other layer affecting genetic expression. So while we may share some common “themes” of dysautonomia, fatigue, pain and hypermobility, it will truly express absolutely uniquely within individuals even within the same family. This is known as variable expression. To borrow another phrase from the Autism community: if you’ve seen one Ehlers-Danlos (or HSD) patient, you’ve seen one Ehlers-Danlos (or HSD) patient! But as you know I feel strongly, every doctor has seen HSD if not also EDS patients whether they know it or not. Heck, we’re the frequent flyers in their offices by default! In fact, everyone has seen an HSD or EDS patient whether they know it or not, we’re that common IMHO. Hopefully the doctors will start spotting us a bit sooner with this information I’m sharing. (Nurses too!) I hope the above has helped to clarify how best to pursue a diagnosis once you do suspect it. Also, “patients can have as many diseases as they damn well please!”, is generally attributed to John Hickam, MD. It’s generally called Hickam’s dictum. Hickam’s dictum is a counterargument to the use of Occam’s razor in the medical profession. The principle is commonly stated: “Patients can have as many diseases as they damn well please”. The principle is attributed to John Hickam, MD. Hickam was a faculty member at Duke University in the 1950s, and was later chairman of medicine at Indiana University. Thank you! I’ve been trying to find the author of that great quote also for a while now, so thank you for sharing it! (I just asked in a Facebook group a couple weeks ago, but no dice.) Hickam’s Dictum – brilliant! And too true for us, also, eh. Ahh… my brain can rest now and stop searching for that answer finally. I have HEDS and looking at the information here on VEDS, I have almost all the minor criteria but none of the major criteria. I suppose that’s good but I never worried about it at all and now I’m going hmmmmm. Good information though. Thank you. A lot of us do, myself included. Definitely get tested for it if concerned and can get a doctor to order the test. It’s the one from UW Collagen Lab I believe I linked to in the article. Good luck! Thank you for that excellent, and informative article. I am also very grateful to you for listing one of my books – but I have another – ‘A Guide to Living with Ehlers-Danlos Syndrome – Hypermobility Type – Bending without Breaking’ 2015, Singing Dragon Press/Amazon. Thanks – I do know about your first book, but I think I thought your second one sort of supplanted it. I’ll defo add it back into my list if you’d like, no problem. It’s how I first learned about Bowen Technique working so well for us. (I love it, personally, just wish I could afford more.) Glad you found me! Oh – I see now, you revised your first book! Okay, will relist, thanks. Er- pale skin implies that you can only have VEDs if you are white. And this is not true. I quite agree, it’s just that black people have not exhibited nearly the same anxiety levels as white people over their visible blue veins. I would suspect it based on family history of internal organ or vascular rupture, not appearances so much. (I show many Vascular features including visible veins but am negative based on actual genetic testing done by the UW lab.) It crosses all racial/ethnic bounds yes. “The two most common types of EDS (hEDS and cEDS) have an autosomal dominant inheritance pattern.” False re hEDS. It can seem to have this pattern in some lineages, but for one (possibly majority) group, with the multiple-alpha-tryptase (TPSAB1) trait, only some get the disease – about a third. At a minimum, even if not environment but other genes make the difference, it’s not likely that the necessary collection of genes are dominant – it’s certainly not the case that we know that. Moreover, inheritance within the group that kicked off the study seems very mixed and complex. This isn’t a small or exceptional group. The percentages of the population they’re talking about could pretty much encompass all HEDS cases, if my back of the envelope calculation is correct. b) It really only explains a subset of the hEDS population. There are oodles of us like me with low tryptase, but still having hEDS (as best we can tell in the absence of a better dx, and yes, I tested for Vascular and Kypho by blood in 2012 based on phenotype) who are not yet explained. Please bear with me as I get the above properly and fully re-written to reflect the major new nosology and criteria change for ALL forms of Ehlers-Danlos Sydnromes plus the new catgory of Hypermobility Spectrum Disorders for those who walk like a zebra, talk like a zebra but have ruled out all forms of EDS and other HDCTs. Sort of our new “catch-all” bin. Will probably cover many if not all/most with fibromyalgia I’m guessing. Apologies and sympathy to all trying to parse the new criteria. Essentially, we now have 7 new forms of EDS reocgnized, for a total of 13 up from 6 before, and… all are now considered rare again, as they tightened the dx criteria for hEDS back up a bit. But the new category of Hypermobiltiy Spectrum Disorders should cover all others whether mildly or more afflicted with any form of joint hypermobility and connective tissue issues after ruling out all other forms of both EDS and heritable connective tissue disorders (HCDTs) such as Marfan, OI etc. Thanks for all your work. Just curious, and confused. How do “older” or oldish people ever get diagnosed with hypermobile/type 3 if they come from small families and without children. I was recently dx at 49 with hypermoble (tho I think I may be classic), but I am not sure I would have been able to get a dx if you MUST have a diagnosed family member. My parents are in their 80’s and never had issues as bad as me, it was hard enough for me to be believed for dx. My brother has died. I have no cousins. Are those with small families just left out now? It looks to be a required criteria. I don’t understand. Sorry if I am not yet using the correct nosology. Just was curious for another opinion. Good luck, I hope that helps. Here’s the actual hEDS criterai now. To clarify: you can pass Criterion 2 if you pass either Features A and C, or A and B, or B and C. (You don’t have to pass all 3, A, B AND C. Just any two of them.) You do not HAVE to pass B – which is the family member. It’s just helpful. E.g., if you don’t pass A, but you DO pass B and C, then you pass Criteria 2. So it would be helpful then. Alternatively, if you don’t pass C but you DO pass A and B it helps. If you pass A and C but NOT B (because you can’t find your family, they are not diagnosed yet/at all/ or not speaking to you like mine, or are adopted E.g. ), you still pass criterion 2. I hope that makes sense. (1) Because of the new stringency on diagnosing hEDS, will healthcare insurance companies still recognize the more generic HEDS diagnosis (so we can take tax deductions for yoga, PT, etc.) OR is a specific ED diagnosis now required? (3) Of all the possible HSD diagnoses, which one is the most likely place you’d slot Osgood-Schlatter? I’m newly researching EDS and truly appreciate the work you’ve put into OhTwist. My best to you. Another great Q! I’m not sure it might not be found across several types/forms frankly, as I think it has to do with speed of your bony plate growth no? But I honestly don’t know. Again I’d try the EDS here: info@ehlers-danlos.com. Sorry I’m not much help, but these are excellent Qs for all of us! Good luck! Thank you for this. Tough to zero in on a moving target! As you suggest, hopefully all our queries trigger a new way of looking at these issues. Okay, I think (think!) I may have finally gotten this sucker sufficiently updated to not confuse the heck out of any new visitors. Let me know if you see any contradictions or inconsistencies, thanks! Jan – April 28, 2017. Take a deep breath, you will get some answers. Think marathon, not sprint, and start gathering that family history. Glad I could help. Good luck!